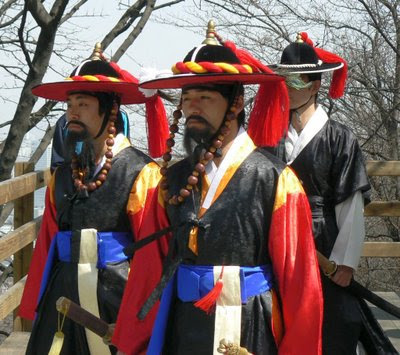 Guards in traditional dress on top of Namsan. 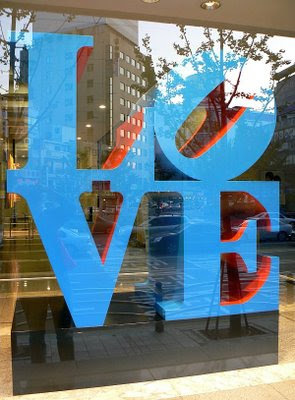 A colour-reversed mini version of the Love Sculpture made famous by Robert Indiana. This one is in the window of a building in Yongsan. If you look closely, you will see the ghostly reflection of your City Photo-Blogger. Looking along the Han River towards Namsan and N Seoul Tower (top centre of the image). 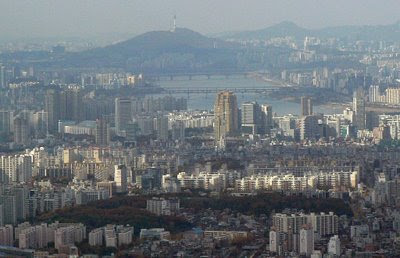 This photo was taken from the Namhansan Fortress. 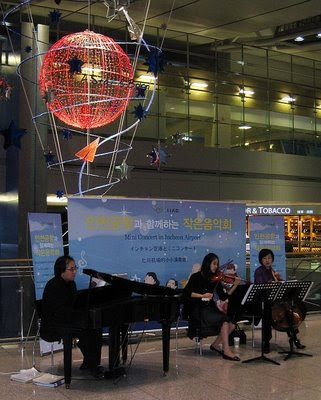 Musicians perform in a mini concert at Seoul's Incheon Airport with a spectacular Christmas decoration suspended behind them. 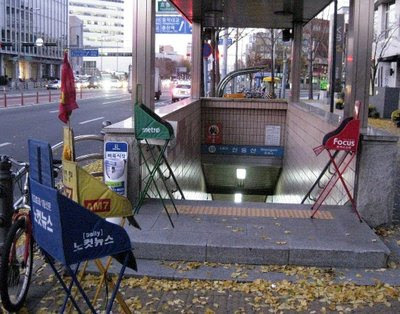 Early morning at the Sinyongsan subway entrance. There is a stairway straight ahead that goes down to an underground concourse from which you can then descend to the platforms. Note the stands (red, yellow, blue and green) near the entrance that hold copies of four different free newspapers for commuters. 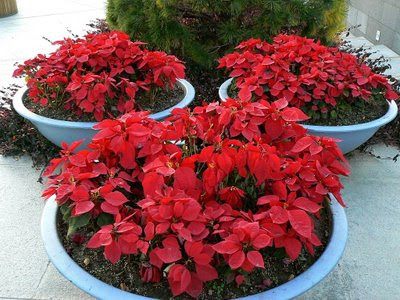 Poinsettias in pots at the National Museum of Korea in Yongsan. 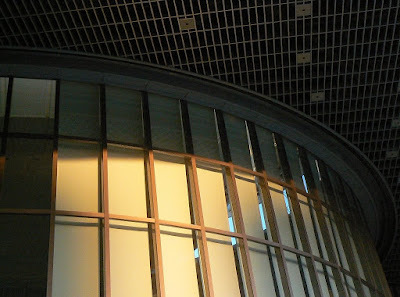 A gentle curve separates the patterns of four-sided figures formed by the walls and ceiling above the entrance to the National Museum of Korea. 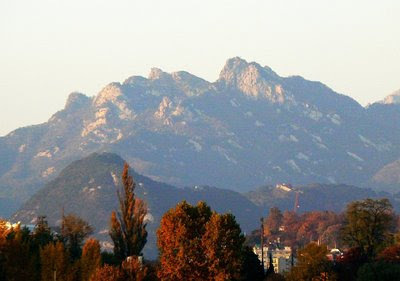 Looking North from Yongsan towards the Bukhansan National Park. 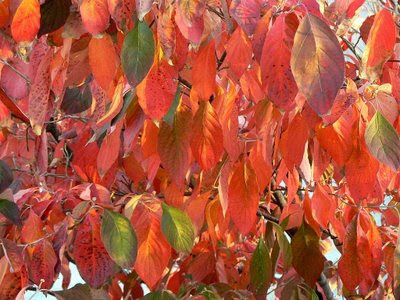 A few defiant leaves retain their green colour in a sea of red brethren. Another shot taken at the National Museum of Korea. 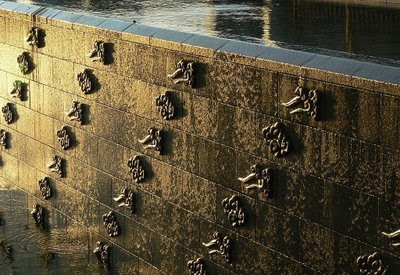 This time of the sculptured water wall near the lake. 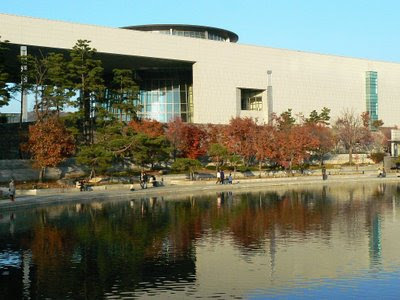 The National Museum of Korea at Yongsan. The museum is an easy walk from my apartment, or a very short train trip (one more stop on Line 4). Besides the wonderful exhibits, it also has restaurants, a great gift shop and lovely gardens. 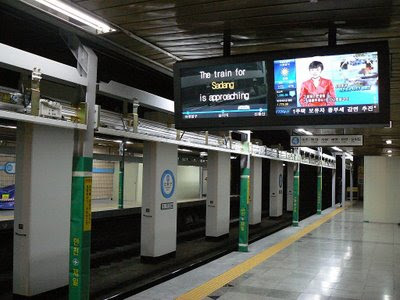 The photo above shows the platform at Sinyongsan subway station. 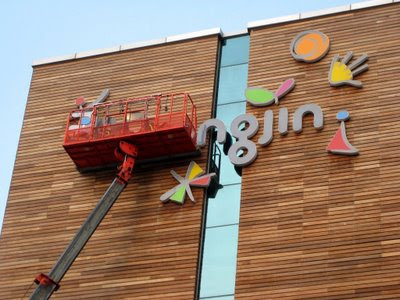 Sin (pronounced "shin") means new in Korean. The station is currently being refurbished; the old metal safety rails on the platform have been removed and are being replaced with the sliding doors seen at many other stations in Seoul. New TV monitors have also been fitted as shown above. 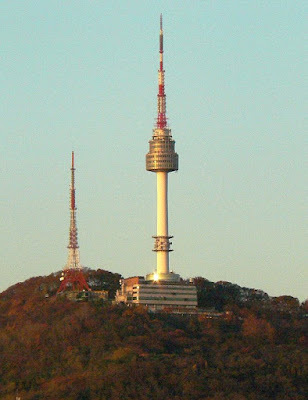 N Seoul Tower, atop Namsan, sparkles in the late afternoon autumn sun. 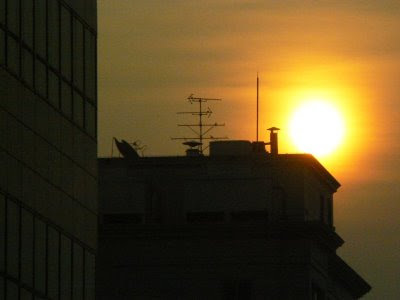 The view from my apartment window a few minutes ago as the sun rose over a nearby building. 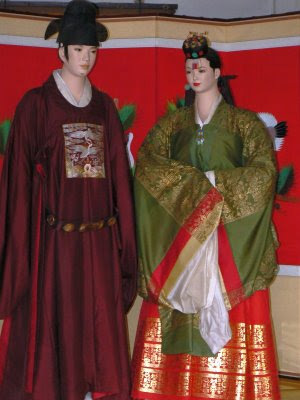 Mannequins in traditional dress (hanbok) at the Namsan Folk Village. Workmen in the basket at the end of a crane make repairs to the sign at the top of the Woongin Building at SNU Research Park. 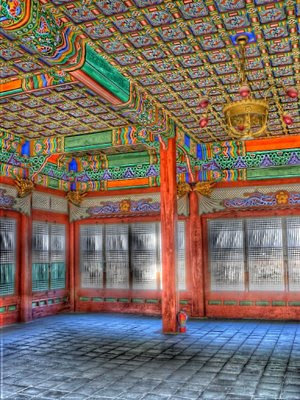 An HDR (High Dynamic Range) image created in a program called qtpfsgui using three separate, hand-held, exposures of the same scene; in this case the inside of one of the pavilions at the Deoksu Palace. The resultant image was then adjusted with a program called IrfanView. I like the surreal dream-like appearance of these types of images. 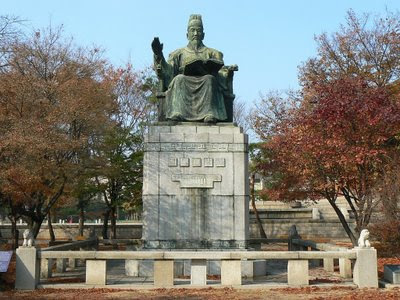 The statue of King Sejong at the Deoksu Palace. King Sejong, often referred to as "Sejong the Great", was the fourth king of the Joseon Dynasty and is best remembered for being the creator of the Korean alphabet (hangul). 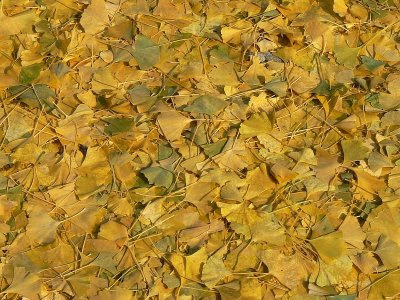 Fallen ginkgo leaves in autumn livery form a carpet on the grounds of the Deoksu Palace. 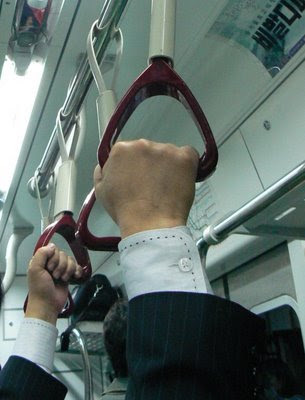 A fellow passenger on a subway train takes no chances and hangs on with both hands. However, more often than not, most passengers, who are not seated, do not use the straps or hand rails when standing and kind of "surf" the moving train as it rocks and sways between subway stops. This photo shows the Namhansan fortress wall snaking off into the distance. 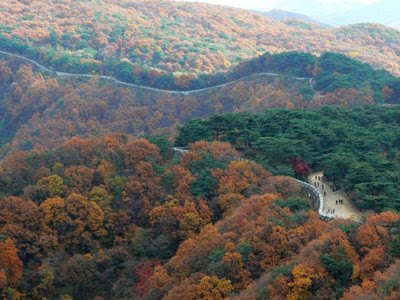 I have written previously about Namhansan Fortress (Namhansanseong) in this blog. I went there again today to see the forest in all its autumn glory and I wasn't disappointed. This photo was taken near the military pavilion that has been classified as Tangible Cultural Treasure of Gyeonggi-do No. 1. Apart from resizing, I have not modified the image. 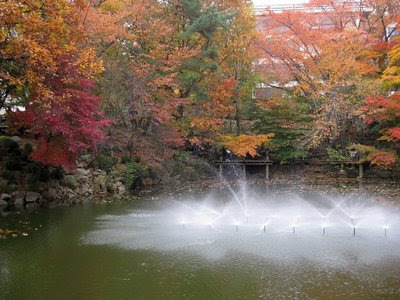 The trees around the pond on Seoul National University campus display their autumn colours. 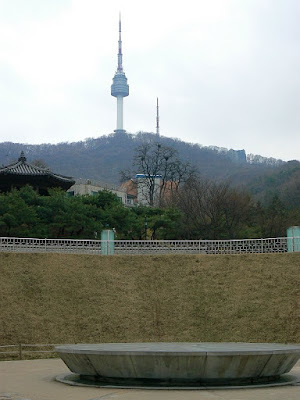 The time capsule (concrete disk at the bottom of the shot) in the grounds of the Namsan Hanok Village complex near Chungmuro subway station, with N Seoul Tower in the background. 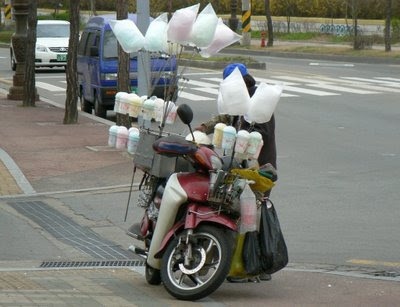 A somewhat camera-shy candy cotton (fairy floss) vendor in Nakseongdae makes his confection on the back of a motorcycle. The Singijeon - An Early WMD? 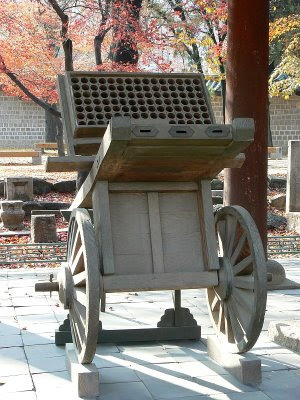 The Singijeon is an early kind of multiple rocket launcher developed in Korea by Choe Museon during the Goryeo Dynasty. It is claimed to be the oldest weapon in the world for which there still exits a blueprint made when the weapon was constructed. 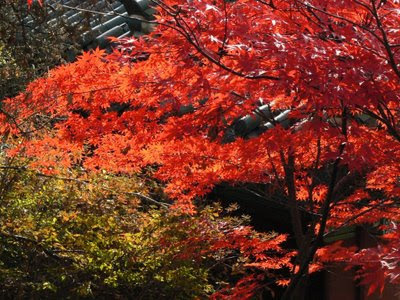 The picture above shows one such Singijeon in the grounds of the Deoksu Palace. I had an opportunity to visit a mixed farm (poultry and vegetables) outside of Seoul. The photo above shows one of the pups of one of the farm dogs. 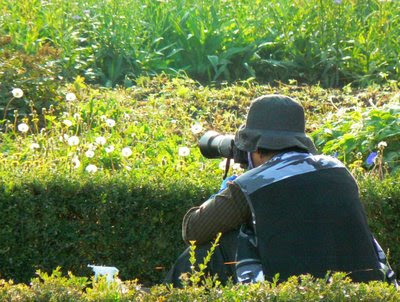 A photographer takes images of the natural environment in Hangang Park beside the Han River. The theme this month is books. 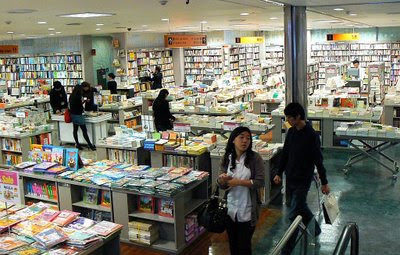 My nearest book store is at the Yongsan I'Park Mall complex, above the Yongsan Station, and is called BooksCan. Speaking of books (how is that for a segue? ), I am currently reading "Buddha" by Karen Armstrong, "American Rifle" by Alexander Rose and "Sacred Causes" by Michael Burleigh; what are you reading?